The Travelling Lindfields: The flamingos of Celestun, Mexico: Everything you need to know before you go. Have you ever seen a flamingo in flight? They take to the air in great clouds of pink, their long, elegant necks stretched out in front trailing a wing span tipped with a broad slash of inky black feathers. Am I the only one who didn't know flamingos have black feathers on their wings? When you see them in captivity their wings are always tucked neatly away with the beautiful ebony feathers hidden from sight. Next to the Mayan ruins at Chichen Itza seeing flamingos in the wild was at the top of my wish list for our trip to Mexico. Surprisingly, when I went in search of information about how, when and where to see them I came up with mostly blanks and conflicting information. Hence this blog post. I have tried to include everything you need to know so you don't end up just blundering into town as we did hoping for the best. 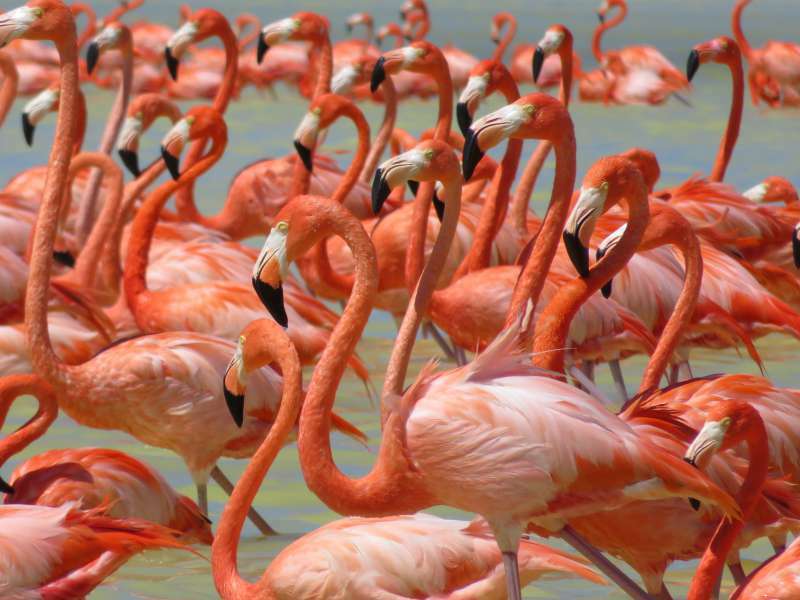 Where can you see flamingos in Mexico? There are two main places in Mexico where tourists go to see flamingos. Both are in the Yucatan Peninsula. One is at Celestun on the west coast about an hour and a half's drive from Merida. The other is at Rio Lagartos on the north coast, about an hour and a half from Valladolid. We saw the flamingos at Celesun. I have read that you can also see flamingos on the island of Holbox. Google 'when can I see flamingos at Celesten (or Rio Largartos)?' and you will get a lot of conflicting information. We were at Celestun in late February and there were thousands of birds. As many as 35,000 flamingos congregate in the Celestun Biosphere Reserve in the November to February mating season. 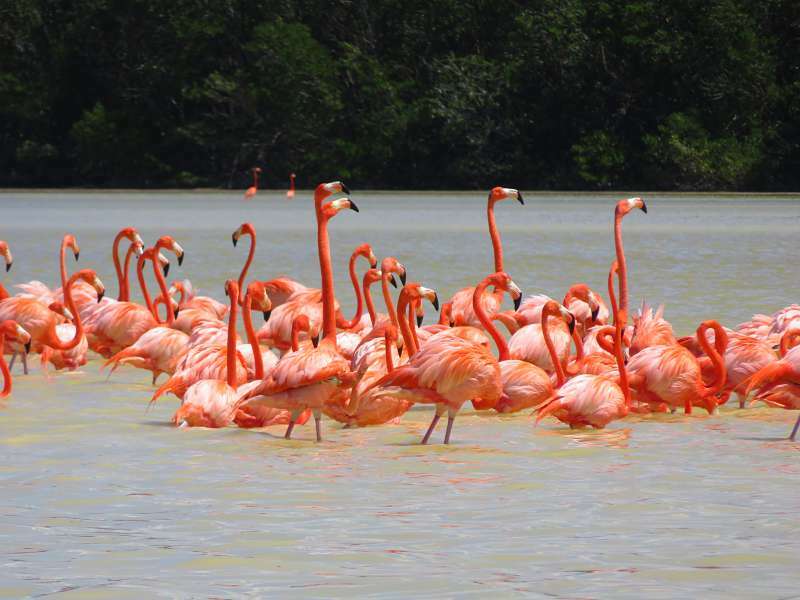 Rio Lagartos has flamingos year round but the highest concentrations are in April to July and October to February. During the April to July brooding seasons there are restrictions on how close you can get to them. How do you get to Celestun? Or - hire a car and do it yourself. Celestun is an easy hour and a half's drive on the cuota from Merida and a challenging, much longer but far more interesting drive on the free roads. Cuotas are toll roads. With a couple of exceptions (Cancun to Chichen Itza for example) they are very inexpensive. They are also well-maintained and easy to drive on but like toll-roads all over the world you don't get to see much scenery or go through any interesting towns or villages. If you are keen to get to the flamingos early I recommend taking the cuota on the way to Celestun and the free roads on the way back. We did it the other way around because we missed the 'cuota' sign on the way out of Merida. Once on the back roads we were stuck with them. We tried a couple of times to get onto the toll road but had to give it up when we found ourselves on a dirt road with more potholes than actual road in the middle of a busy market. If there was a way through we couldn't find it. All I can say is - 'whether it is electronic or paper, try to make sure you have a good map with you'. Our Garmin Nuvi GPS was unreliable and even Google Maps send us the wrong way a few times. Rural Mexicans take a long siesta in the middle of the day, from about noon. During this time the villages shut down almost completely. Driving through them is much more interesting, and challenging, when the inhabitants are up and about. Do you need to take a tour to see the flamingos? 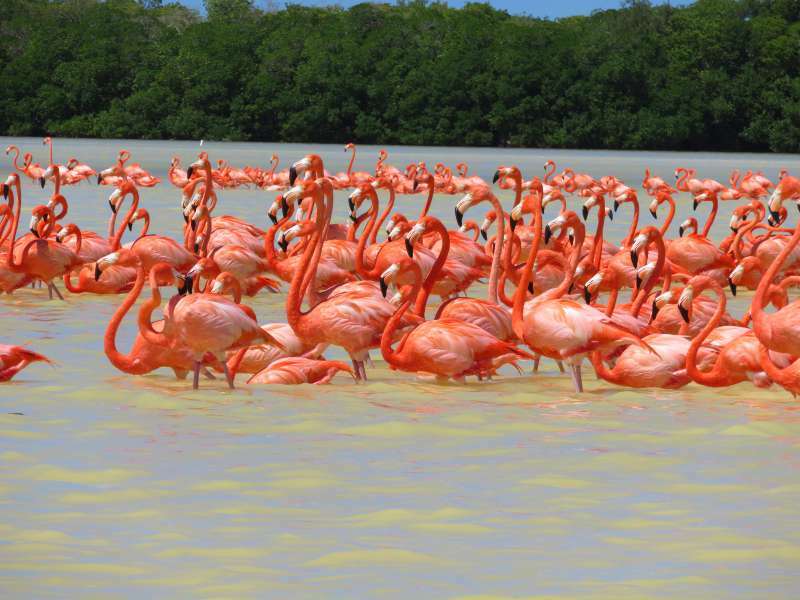 Once you arrive at Celestun you need to take a boat tour to get out to where the flamingos congregate. Where do you go to join a tour? We took a Parador Turistico Cultur tour - a state sponsored guide service. As you enter Celestun from the east you cross a bridge. Look for the Flamingo tours centre on your right straight after the bridge - you can't miss it. Once you have parked, head into the white building and you will find a window where you can purchase a tour. You can also arrange with local fishermen to take tours straight off the beach in town but it is further out to where you will see the flamingos. The boat jetty adjacent to the ticket office at Celestun. The cost for a tour is 1569 pesos (AUD$110). (Bring cash - they don't take credit cards.) For that you get a whole boat which seats eight people. If you want to reduce the cost just hang around for a while and see if anyone wants to share. We decided to splash out and have a whole boat to ourselves. Neither the lady selling the tickets nor our boatman, Rodriguez, spoke more than a few words of English but foreign tourists only come for one thing, to see the flamingos, so language isn't an issue. Flamingo tour boats lined up ready for tourists. What is the tour like? How many flamingos will you see? If you are interested in wildlife you will love it. These are the pinkest flamingos in the world and there were thousands of them. I would do it again in a heartbeat - and again, and again and again! The tour took about ninety minutes. Our first stop was at a small flock of about a hundred birds preening themselves and feeding in the shallow water. After ten minutes or so Rodriguez turned the boat ready to head away. Don't be disappointed, the small flock is just the beginning. Next he brought us up close to what must have been more than a thousand birds. Again they were just standing around in the shallows preening, feeding and looking superior in that way that only flamingos can do. They were completely nonplussed by our presence, not seeming to care at all about us and happy for the boat to get within 25 metres or so. From time to time small group of birds took off in displays of precision flying. With their long elegant necks stretched out in front and their equally long elegant legs trailing behind they were a stunning sight. Literally translated as Eye of Water, the Ojo de Agua is a natural rockpool fed by a freshwater spring bubbling up from under the ground. Set amidst mangroves not far from the flamingo feeding ground the spring was the last stop on our tour. I expected it to be a disappointment, but I was pleasantly surprised. The water is such a lovely aqua blue and so crystal clear it is well worth a quick look. You can take a dip while you are there. Even the mangroves were fun. Gliding through as silently as we could we spied a couple of small crocodiles lurking in the shadows waiting for unsuspecting prey. If, like us, you choose to take a boat to yourselves you could ask the guide to skip the Ojo de Agua and give you more time with the flamingos. We didn't, partly because I have a chronic case of FOMO (fear of missing out) and so wanted to get a glimpse of the Ojo, but also because we had plenty of time with the flamingos as it was. Beautiful as they are, there is only so long you are going to want to sit and stare at birds! Can you stay at Celestun? The short answer is yes. We saw lots of B&Bs and private hotels. 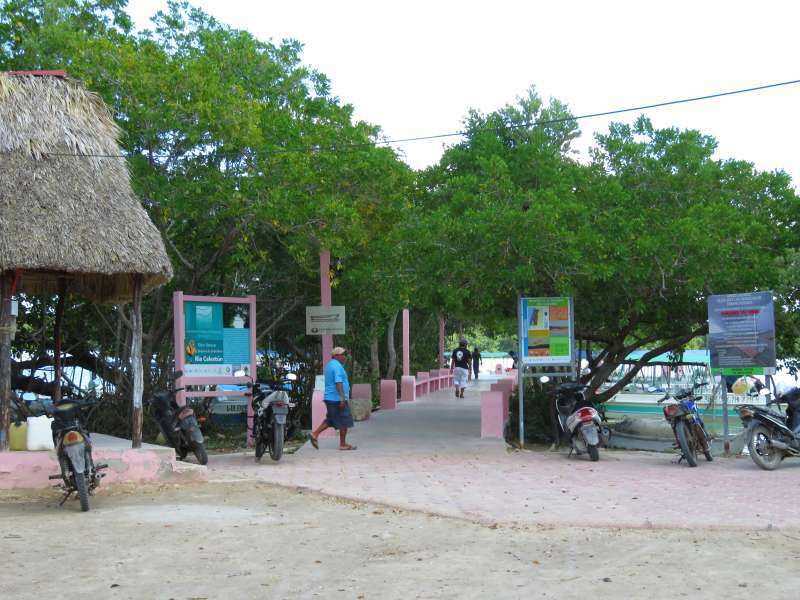 However Celestun is a sleepy little village, don't expect five stars. There are six different species of flamingos. The American Flamingo, found at Celestun, is the largest and pinkest. Flamingos are white, not pink, when they are born. They obtain their pink colour from the colour of the worms they feed on. A mating pair of flamingos produce one egg which takes about a month to hatch. Both males and females help to sit on the egg. Do you have a passion for seeing animals in the wild? If so you might want to check out The Wildlife Diaries by fellow travel blogger Margarita. Margarita is on a quest to see all the world's species of wild cats in their natural habitat. You can read her latest post On the Trail of the Jaguars in the Pantanal - Brazil here. Our guide scooped up a handful of (very pink) worms to show us. You are not the only one that didn't know about their black feathers. I have only seen small flocks of flamingos (and not the plastic lawn ornament variety) so it must be a real thrill to see more than 1,000. I did not know that they ate worms; I thought they ate some type of shellfish that gave them the pink colour. The black feathers are gorgeous. They contrast with the pink to make flamingos in flight a sight to behold. Like you I had only ever seen small flocks before we went to Celestun. They were always in captivity and I realise now they probably had their wings clipped so they couldn't fly. If you do a search for baby flamingos on the internet you will probably find a few photos of them - all fluffy and very white. 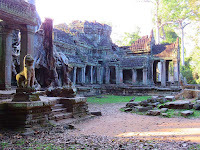 I recall seeing a couple of photos when I was researching our trip. So excited to read this! I like how you gave as many tips as possible for seeing the flamingos!! I definitely want to go! I've actually never seen flamingos in their natural habitat before! Thanks so much for sharing on #TheWeeklyPostcard! I had only ever seen flamingos before in captivity. Seeing them in the wild was so much better. WOW this looks so cool. We were in Mexico recently but unfortunately no Flamingos for us. Thanks for all the great information, I've pinned this for next time we're back. I see from your blog that you visited the Yucatan Peninsula. It was definitely my favourite part of Mexico. 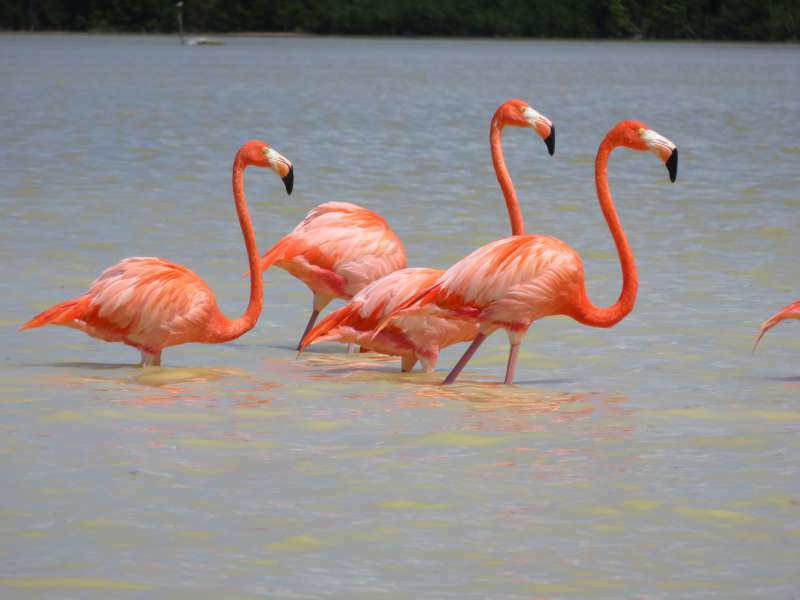 I didn't know about the flamingos of celestun before so thanks for enlightening me. Your photos are fantastic! And I didn't know they ate worms - I always heard that their pink color came from eating shrimp. Maybe they eat shrimp as well, perhaps in other places. Our guide reached down and grabbed a handful of sand so we we could see the worms. 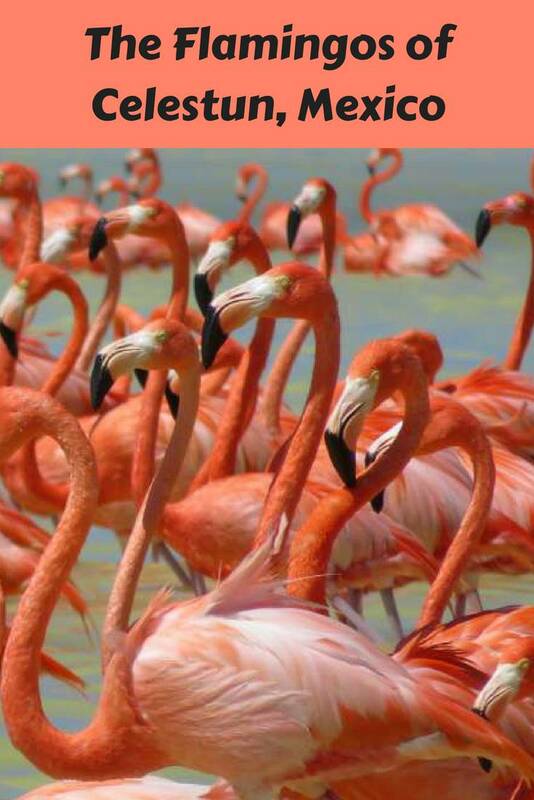 I have never seen flamingos bu your post was extremely educative and enlightening, Lyn. I really didn't know about their color and I really hope I'll get the chance to see them! I am am sure I have seen them somewhere in Sydney - at the zoo perhaps. Maybe they aren't there any more. I loved Yucatan - every inch of it. Now you will just have to go back to Mexico! I don't know about you but I hate it when I find out there was something great which I missed when I travelled to a place - sorry about that. My mother used to do this to me all the time. I would hardly be off the plane and she would say 'Did you see...' and it was nearly always something I had missed. Brilliant shots Lyn! 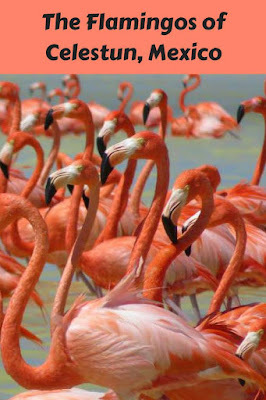 Pinkest on earth indeed; I've not seen any flamingos that come close to this color....from my online viewing. Definitely worth a tour because I love seeing wildlife in its natural setting. Rocking post. The pink colour was stunning, although to be honest I think I have probably seen a few in captivity which rivalled it. The flamingos at Celestun were not at all concerned by our proximity. I think they must have got used to being looked at and photographed over the years. 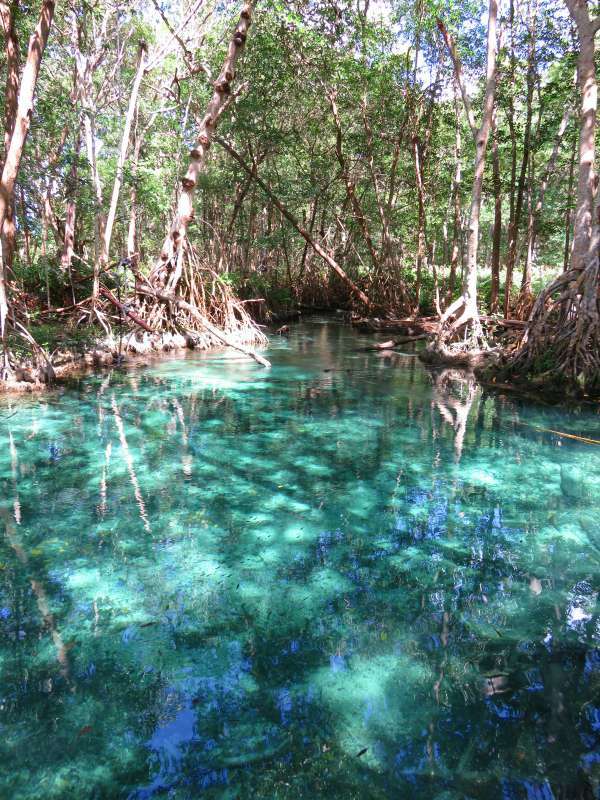 There was a small group near the entrance to the mangroves leading to the Ojo de Agua and they were almost white. I don't know why - perhaps their diet was slightly different to the main groups. I I have just added this to my bucket list! Great post! I look forward to reading your post on Celestun one day. What a great post! I'd love to see those flamingos in the wild. I recently saw the marching flamingos in the Nassau zoo and that was quite amazing, but seeing them en masse in the wild must be more thrilling--especially in flight. What on earth is a marching flamingo? It sounds like a fun thing to watch. God-sent! We will be in Cancun in October next year so I will have somewhere else to go besides Chicken Itza, thanks to you. But we will go to Rio Lagartos! Rio Lagartos is probably better than Celestun in October. 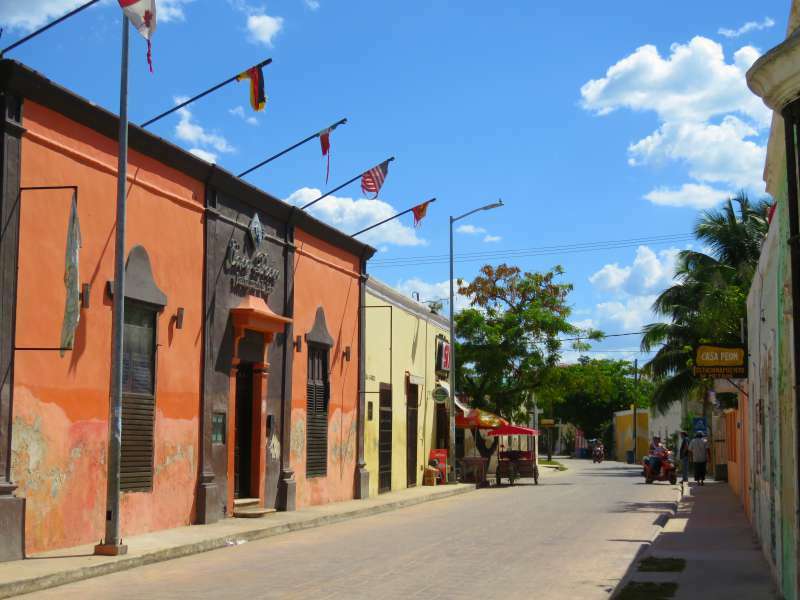 From Cancun you could investigate going to Holbox Island too. Maybe you should also think about Coba and/or Tulum. They are both about the same distance as Chichen Itza from Cancun. Coba is hidden away in the jungle so it is cooler than the other ruins. It was by far my favourite. Keep an eye out for my next few posts because I will write up both Coba and Tulum soon. Such beautiful birds and an awesome reason to visit this area. Love that there is also a rockpool to check out. Sounds like a responsible way to see these animals. Thanks for sharing! Even without the flamingos Celestun is worth a detour, just to see a laid back Mexican town, although I wouldn't drive for hours to see it. What amazing creatures and your photographs capture the flamingos so well! I hope to get to Merida and make a detour to Celestun. If you go to the Yucatan Peninsula but don't get as far as Mexico, you can always try seeing the flamingos at Rio Lagartos. 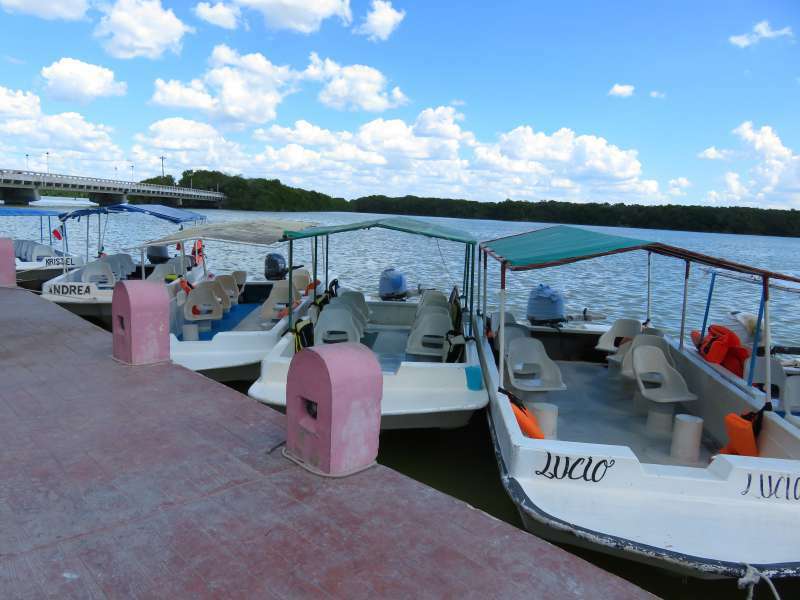 Rio Lagartos can be done in a long day trip from Cancun, or stay a couple of nights at Valladolidand go from there. Valladolid is lovely. I recently saw flamingos from a distance in Bonaire, an island in the Netherlands Antilles. You really got an up close view of them in the wild! I was told they get their pink color from eating brine shrimp and algae, but just looked it up and see that larvae are also one of the foods they can find, so I am assuming it depends on location and availability... In any case, they are magnificent birds! Great post and pix! I agree with you that their diet probably depends on the location. Perhaps that is why some flamingos are pinker than others.